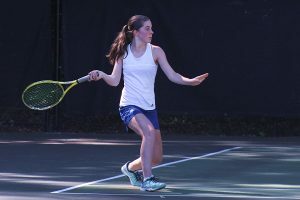 The Chamblee Lady Bulldogs swept the singles points against Kell to earn a 3-2 Class 5A girls’ state playoff victory on Tuesday to earn the program’s first state championship berth. The pressurized semifinals between a pair of undefeated teams was a test of wills as Chamblee jumped out to a 2-0 lead and needing just one more victory to clinch the match. Kell battled back to make it 2-2 with wins at both doubles. Senior Leeza Ershtein would be the deciding factor at No. 3 singles. Ershtein entered the match 22-0 on the season and cruised to a 6-1 win in the first set. She battled adversity in the second set, but won four consecutive games to win 6-4 and clinch the state final berth for Chamblee which improved to 24-0 on the season. The battle of two undefeated teams got off to a rocky start as Chamblee’s No. 1 singles player junior Olena Bilukha had to rush to the courts straight from taking her Milestone and AP Physics exams without eating or drinking. Bilukha was up 4-1 with a break of her opponents serve when she got sick and had to take a break. She returned to finish off the set with a 6-1 victory. Kell’s No. 1 player battled in the second set against the undefeated Bilukha (17-0 in 2017, 51-0 in three seasons) to force a tiebreaker at 6-6 in the second set. Bilukha won the tiebreaker easily at 7-2 to clinch the first point for Chamblee. Sophomore Grace Pietkiewicz improved to 15-1 on the season with a straight set 6-3, 6-4 win at No. 2 singles to give Chamblee a 2-0 advantage with two of the matches complete. The Number 1 doubles match took three and a half hours to complete as Chamblee’s Madeline Meer and Madison Trinh battled back from a 2-6 first set defeat to win the second set 6-4. They fell behind 0-5 in the third set and worked hard to pull within in 3-5 before Kell’s team closed out the match at 6-3 in the third set. Kell (21-1) won the No. 2 doubles point as Chamblee’s Kendalle Smith and Emilya Ershtein fell 1-6, 3-6 to even the match at 2-2. 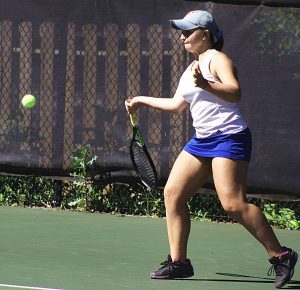 Chamblee has the opportunity to win the first girls’ state tennis title for DeKalb since Lakeside’s win in 1984 and match the boys’ program (1998) with one state championship apiece. The last state tennis title for DeKalb was the Lakeside Vikings’ victory in 2001. Chamblee faces Starr’s Mill in the state championship match set for Saturday, May 6 at the Clayton County International Park at approximately 2:00 pm depending on prior matches finishing. Starr’s Mill defeated Harris County (5-0), Rome (5-0), Riverwood (3-2) and Carrollton (3-1, semis) to reach the state title match. Chamblee has playoff wins over Woodland (5-0), Bainbridge (3-0), Union Grove (5-0) and Kell (3-2).